A sweet salt-marsh breeze swirls past majestic oak trees playfully waltzing with Spanish moss draped over ancient limbs. Eleven acres of emerald-green meadows beckon bare feet to take a swim. Egrets wander the meandrous, teeming-with-wildlife Ashley River. Birds whistle in the distance while the sun sparkles through an ocean-blue sky. The Ponds, rooted in Summerville, South Carolina, is the center of this spectacular 2,000-acre community developed by the prestigious Greenwood Communities and Resorts Company. 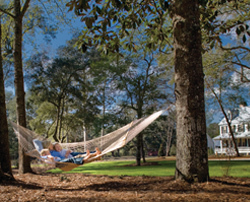 The Greenwood, South Carolina-based company has been a leader in master-planned communities since 1978. For nearly three decades, Greenwood Communities and Resorts has established award-winning private residential and resort-oriented neighborhoods throughout the Southeast, stretching from the Florida Panhandle to the mountains of North Carolina. Their mission is �to create memorable places that foster meaningful and fulfilling lives,� according to their company�s Web site, www.GreenwoodCR.com. The Ponds offers more than 1,900 new custom home lots priced in the $100s to $200s. New single-family homes, multifamily condo units and townhouses start from the low $300s.The average home will range between 2,300 and 2,800 square feet, and each builder will offer its own special warranties and incentives. All homes on the 49 builder lots �will be reminiscent of Old Summerville, with most including porches, workable shutters and the authentic Lowcountry architecture this area is known for. Builders will offer Cottage, Southern Colonial, Victorian, Cape Cod and Bungalow-style homes,� according to the Web site. Trust is very important to the Greenwood Development Company, a devout believer in building amenities before a project is complete, allowing buyers to see firsthand the quality construction that will grace their own homes. According to the Web site, �Building amenities in new communities early in the development process ... avoids having to make a lot of promises and evokes trust from buyers who can see, touch, feel and use the real thing.� The amphitheater, farmhouse, neighborhood pool and recreational complex, along with the first phase of trails and sidewalks, will be complete before the first residents settle into their new homes. This history-laden property was dubbed The Ponds in 1682 by its first owner, Andrew Percival. He built Weston Hall Plantation on the lush land described by locals as a hidden gem. From 1723 to 1765, the Donning family managed the settlement. Many other families operated the estate, known for its rice harvest, and, in 1818, John Schulz purchased the plantation. His family sold the property to lumber dealer Edward Lotz, who harvested the cypress trees to manufacture shingles. The most recent owners, the Simmons family, acquired the land in 1911, grew corn, cotton and sweet potatoes and raised sheep and goats. The Ponds was a popular place for hunting and fishing. The farmhouse, which is still located on the property and has recently been restored, was used as a hunting lodge. 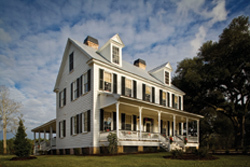 Today, the 19th century farmhouse serves as the visual focal point for the village center, which offers 50,000 square feet for retail shopping and an outdoor waterfront amphitheater that will be shared with the Summerville community and host art exhibits, cultural events and music festivals. In April 2008, the Summerville Community Orchestra performed there under conductor Alexander Agrest. Also located in the heart of the civic corridor are a Dorchester County Sheriff�s Department substation and a Fire/EMS station to which Greenwood Development donated $500,000 and two acres of land. The 8,200 square-foot facility houses three fire trucks and two emergency service vehicles. Greenwood even donated a $1-million parcel of land for the Summerville Family YMCA. The 30,000�square-foot facility will be available to all Summerville residents and will largely be funded by Greenwood Development. The company will invest $4 million in the $5.4 million, eight-acre project, which will include aerobics rooms, cardiovascular and free-weight equipment, locker rooms, recreational fields, a wellness center, a supervised playground and organized programs for all ages. Greenwood also contributed 40 acres of land for a future public school. The Ponds Conservancy is a non-profit community organization that will also benefit the Summerville Community as a whole. The Ponds� Web site states that The Conservancy is �a 1,100-acre preserve that accounts for more than half the total land at The Ponds,� and �is a significant natural landmark and amenity.� Its purpose is to enrich the lives of everyone in the community through cultural, educational and historical programs as well as through social and environmental awareness events. All property owners will automatically receive a membership with The Conservancy. Other outdoor activities will take place on more than 26 hiking and walking trails, stretching over 20 miles and made of asphalt, concrete, natural materials and plantation mix. All trails will be named and marked and lead explorers back to the farmhouse. Residents will enjoy the 38 miles of sidewalk that will connect all areas of the new development, as well as four neighborhood swimming pools, recreation fields and wilderness areas, 38 acres of active park space and 50 acres of passive park space. Fishermen will be pleased to cast their lures into Schulz Lake, which will be filled with bream, catfish, crappie, mudfish, smallmouth bass and largemouth bass. 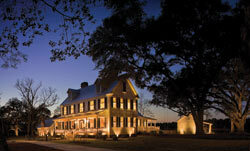 Adventure seekers can canoe or kayak the Ashley River or take a dip in the 25-meter competition pool at the farmhouse. The Ponds sales cottage, at 140-C W. Richardson Ave., is open Monday through Sunday between 2 p.m. and 6 p.m. For more information, call (843) 832-6100 or visit www.DiscoverThePonds.com. For more information on Greenwood Communities and Resorts, visit www.GreenwoodDevelopment.com.